Other Distinguishing Features: Green skin and fin, freckles. Powers: Amy Dragon possesses superhuman strength. 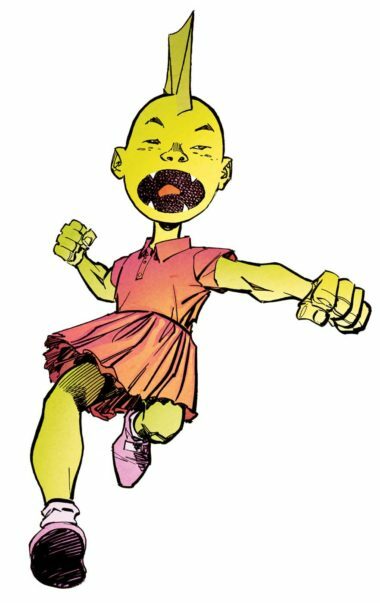 She has a regenerative ability which allows her to grow back limbs and regenerate missing parts, inheriting powers from her father. Amy Dragon is the daughter of Malcolm Dragon, and Maxine Dragon. She is the first known female “chosen one”. While Amy initially appeared to be completely human, that proved to be a temporary transitional state. Amy later transformed to have green skin and a fin, like her father and brothers. Unlike her siblings, Amy has five toes on each foot. Although her brothers Jack and Tyrone are half-brothers, the world assumes the three siblings are triplets. She later rips out the arm of Maxine’s landlord Craig while playing with him while he holds her. Later, her family moves to Canada.